Okay so there are quite a lot of promising surfaces on which to print. Releasing parts can be a problem though the materials grip at lower temperatures and therefore don't release at room temperature. So does anyone have any suggestions for a material that can be used as a flexible substrate for a thin adhesive surface applied to it? Have you ever used PEI? PEI- Yes once and found it rather challenging, parts were too well adhered.I didn't give it such thorough testing as the build plate I am currently testing, with a wide range of temperatures/first layer heights etc.. but it seems the challenge with PEI and this new material which might be PEI based is that they grip too well. Putting things in the freezer to get them to release outweighs, for me at least, the advantage of getting ABS to stick at 60 deg C.
I'm coming from using Printbite which needs higher temperatures to adhere but releases at higher temperatures, for convenience. Which of my requirements is contradictory? Cheap? Edited 1 time(s). Last edit at 07/11/2017 09:36AM by DjDemonD. Thanks Mike, what I had in mind was something thicker. Something like this [www.printinz.com] but there must be a readily available sheet material that can be bought for a reasonable cost. I don't want to print on it rather use it to adhere a new surface which is very promising. Edited 1 time(s). Last edit at 07/11/2017 09:54AM by DjDemonD. I've never had any problem getting either ABS, PLA, or TPU to let go of PEI. No, prints don't always fall off when the bed cools, but a little "convincing" with a scraper does the job every time. It is better to err on the side of too much stick than too little. 5-6 mm thick, flexible, and thermally conductive are contradictory. You can have 2 of them, not 3. If you need flexible, why does it need to be 5-6 mm thick? Usually one goes for thickness to get rigidity. Thermally conductive and flexible are possible with a thin piece of metal, but then it won't stay flat. That's the problem that cheap printers have and the reason why so many clamp glass to the beds. Okay I can see your point, my intention is to DIY-emulate the flexible printing surfaces being offered for sale right now, which seem to have these properties. It doesn't need to as thermally conductive as metals, as the highest temperature required with the other material I'm testing is 60 deg C, easily achievable even with an under-powered bed and a slightly insulating substrate for the printing surface (very much like glass come to think of it, but with flexibility to enable parts to be removed). I want to avoid the scraper, and the damage to the surface. What I love about Printbite is no scraper is required - ever, but the temperatures needed for good adhesion are on the high side. A flexible material would enable easy removal or swapping of build plates. The concerns are that the material will deform when heated, or prove to be too insulating, or be far from flat. The thickness is to discourage deformation when heated. I glued a magnet foil on my MKIII heatbed and then glued a ferrofoil on an Ultem sheet. The magnet foil is a good heat spreader, as is the ferrofoil. So far the combination held up to anything, including 110°C for ABS printing. Sounds like a way forward I had a magnetic flexible sheet in mind. Like the stuff flexible fridge magnets are made from. Thanks. Edited 1 time(s). Last edit at 07/11/2017 01:44PM by DjDemonD. I am have been testing magnetic beds to create a flexible bed at affordable prices. I have just received DjDemonD piezo z probe which i will use to test the flexible bed. The right type of magnetic material needs o cope with 120degrees or it will demagnetise, so it needs to be ferro based. I have done trials with two ferro based magnets, one on the bed and the other on the build plate, it printed well until using abs with a print that's long and thin the two magnetic plates separated whilst printing. Currently testing a ferro base on the heated bed and a magnetic medium on the build plate to add stiffness to the build plate, i will publish results soon. Sounds good, I hope the sensor helps. The Geckotek build plates were spring steel plates. Type EP-2 conductive rubber, from 1-100mm thick. Excellent suggestion. Can you print on it? I don't expect you to know off hand, but a conductive material you can print on, is a printing surface and a probing modality rolled into one. 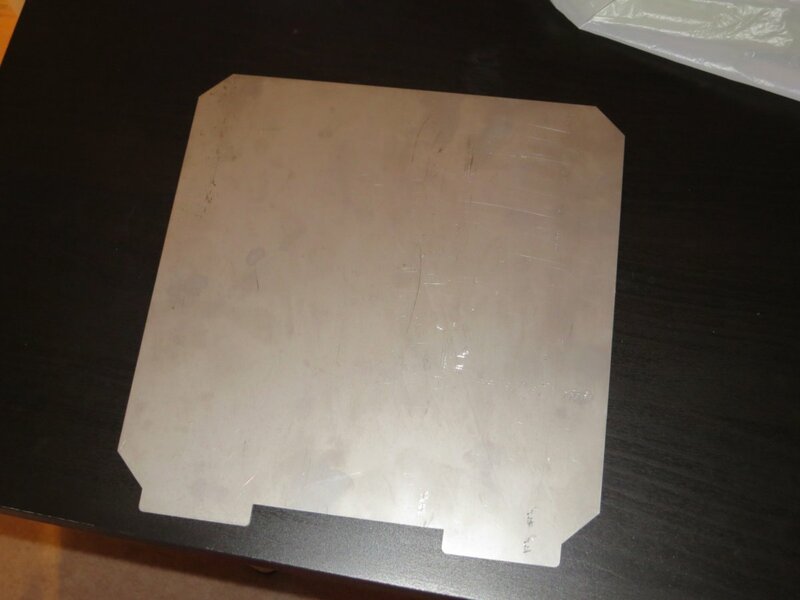 I've bought a custom-shaped laser-cut 0.5mm 304 grade stainless steel sheet from LaserMaster (a smidge under £10). Send them a drawing of the shape you need by email (or I think you can attach it to the order form) and select 1mm but then specify 0.5mm in the comments. And a sheet of PEI (but you could use whatever build surface you prefer I imagine) - about £8 in the UK. The 0.5mm sheet should hopefully be flexible enough for bending/twisting to get the parts to release. I'll be careful not to over-flex the sheet. The Neodymium (higher Curie temperature) adhesive should be tolerant to normal (for PLA and PETG) heater bed temperatures. I'll just cut the magnetic adhesive sheet into strips to cover the build plate - a bit like Angus did in his YouTube video. Then the PEI goes on the steel sheet. Spring steel would be nice but is hugely expensive. I'll post here again with results when I get it all installed. Edited 2 time(s). Last edit at 05/22/2018 03:14AM by JoeK1973. I'd be concerned about the PEI sheet cracking, rather than overstretching the steel sheet?! What build plate would you suggest? Is Buildtak more flexible? Can't say. They all come with an adhesive layer. How will it react under stress? A general rule is, the thinner the sheet the better it can withstand flexing. I have thin PEI sheets on a steel plate and directly on magnetic foil. The later cracked when i bent it very strongly by accident, it is still useable though. You don't need to worry about demagnetization and can cheaply rotate a bunch of sheets. I suspect an aquarium pump with the valves reversed can produce sufficient vacuum, but you might also want a reservoir and switch so the pump doesn't need to run continuously. Another vacuum table one at [www.youtube.com] showing how quick it is to change the build surface. You don’t need Neodymium, for me the simple foil holds up to the 100c i use for printing. I cannot see how this is going to work as 304 stainless steel is not magnetic. I have a system also available but initially i will launch it for 220mmx220mm beds, to fit my duplicator i3. Beware of what neodymium sheet you use as the material is only good for 70 to 80 degrees, the material can be sourced for 130 degrees plus. Haha, yes you're right. I realised this too late unfortunately. The stainless steel is 'slightly' magnetic but not really to the strength we need for a constantly moving Y-axis on i3 style machines. Pity as the laser cut shape (pic attached) is great. LaserMaster also do mild steel (magnetic) but the thinnest sheets they do in that material are 0.9mm which is probably not felxible enough for this purpose. I'll keep a lookout for high temp neo magents, thanks - although I now think a better solution may be to place the magnets on the underside of the heated bed (and use a different steel for the buildplate lol) - the worry I have with that is that they may affect my sensor? I will launching a system for the duplicator 3i would this fit your machine? The bed size will be 220mm x 220mm with 15mm chamfered corners plus 10mm overhang for a lifting tab. The kit will be under £40. I'm not sure. My bed is 214mm x 214mm (standard Mk2 / Mk3 heated bed). So there would be a 3mm overlap on each edge. Not sure if the screws would be fouled even with the chamfered corners. Makrolon SL (polycarbonate with UV coating)) Scuff it up with some 3m scotch brite and clean with alcohol. Do Not Heat more that 39C (will permanently bond with too much heat) Comes in 3mm (1/8") and is very flexible. So, Spring steel is quite hard to find. After scouring the internet I have not found any reliable sources for it. Locally, I have found a few merchants but they will only sell large sheets around 300x2000mm. This means a 220mm^2 works out around £15-20 each and this is about what Buildtak sells the plate for, standalone without the magnetic system. Doh! I do wonder if stainless or mild steel would be a suitable drop in. So far I've got hold of some 0.7mm thick magnetic stainless (430 grade I believe) and overall it has good magnetism to my cheap magnetic sheet. However, it only has a slight bend to it, and I think over time it will likely bend to the point of being unusable. This is disappointing, but I will set it up with some PEI anyway to see how it holds up. It's not so much about bending over time, if my understanding is correct it's more about how far it can bend or flex before it deforms permanently. So using other kinds of steel you'll just need to be careful with how much you flex them.